How To perform a Muriatic acid wash on a Honda Express NC50 DR Racing 70cc (46mm) cylinder jug. 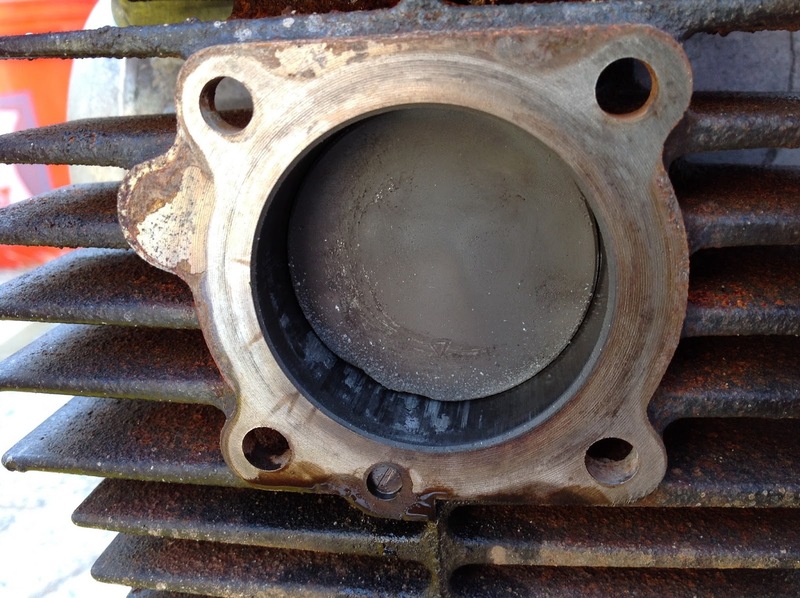 Honda Express Moped nc50 1978 engine cylinder repair using Muriatic acid wash technique. Highly caustic and dangerous! Will even dissolve iron. This amateur attempt is used to repair a multiple soft-seized Honda Express Moped cylinder jug. The object is to use the acid to remove the aluminum left by soft-seize on cylinder jug wall. DO NOT ATTEMPT. DO AT OWN RISK. NOT LIABLE FOR ANYTHING SHOWING IN VIDEO. Feel free to leave feedback and suggestions on video, process, and/or any questions. Honda Express Moped Engine Soft-Seize Cylinder Jug Piston Seizure : Woops! The "low end" throttle was very poor, being sputtery and slooooow on the go. But, when I was in the 15-20 mph range... the moped FLEW! Because I was breaking in the new setup and honda carb, I never had the throttle more than 1/2 and kept the speed to 30-35 mph (measured by the Trail Tech vapor speedometer). The moped ran excellent for 30+ miles and unfortunately my Trail Tech vapor temperature gauge is not installed correctly, so I was running without and monitoring of engine temp. On my way home there was a half mile or so of flat open back-roads and I decided to test max honda nc50 acceleration. I was probably between 35-38 mph and the honda noped began to "buck" (like I was jamming on the breaks) and then finally the engine died and I cruised to the edge of the road. At the time, I didn't understand the problem. I thought it might be electrical or perhaps something went wrong with the carburetor and the engine lost fuel. 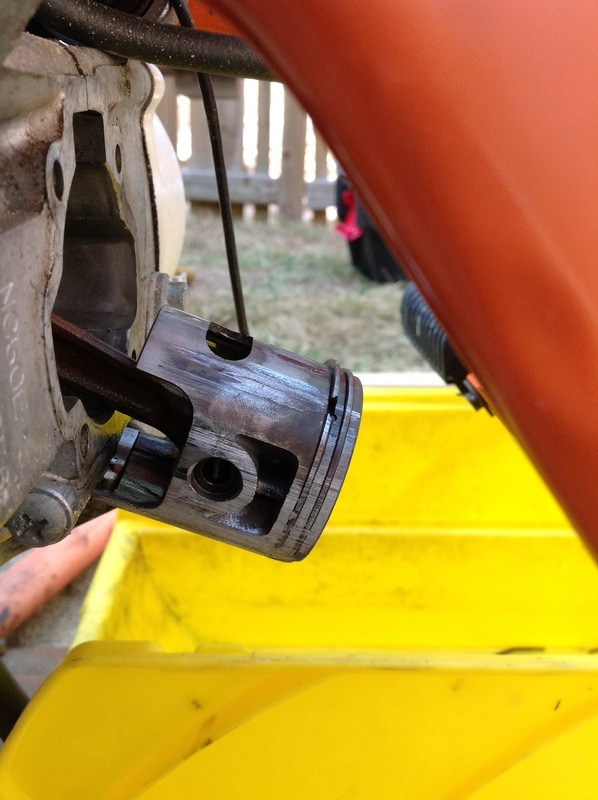 As see in this mopedarmy.com forum post, I experienced a Honda Express Cylinder Jug Soft-Seize. As you can see for the honda express parts photo at the beginning of this post, I had soft-seize the engine a few times 5-10. After the piston and piston rings had melted to beyond functionable, I was unable to start the moped because I lost all compression I had. Of those options I choose the Muriatic Acid Wash technique, because is was the least expensive. $60 for the Honda Dr 70cc 46mm upgrade piston. $7.29 for the Muriatic Acid. Some chemical resistant gloves, baking soda, Rubbermaid tub, goggles, air mask, paper towels... all things I already owned. Next post reveals the video documentation of the process. Make sure good new honda nc50 battery. All new oils and gas. Note: 1978 nc50 has the oil mixing and going directly into the stock intake. You would need to cap off the stock intake. I have seen some people fill the old oil reservoir with pre-mix as well (run at least 50:1 mix, especially when kitted engine) and use a plastic fuel-rated "Y" connector with the main fuel line and get a little "extra" gasoline storage. Rear Fender Honda Express Moped NC50 1978 Modification. 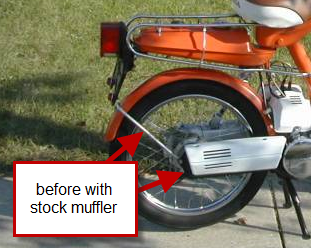 For those of you who have decided to upgrade your honda express muffler, but would like to keep your stock rear fender... this post is for you. Simply use a grinder, hacksaw, Drummel with metal disc, or something else equally effective. You can see I cut one of the two honda express fender braces (the one on the right-hand side of the moped scooter). Using the stock bolt brace that connects to the air intake and the other rear brace that connects to the drive gear box on the left-hand side of the noped. I would suggest using a locking washer or "lock tight" on the bolts to keep them from falling out. There will be a lot of vibration without the support that connects to the honda muffler. Motion Left Moped Honda NC50 Express Sidebleed exhaust pipe muffler is here. This part is one of the few scooter parts I have left to complete my honda express moped "build". Still planning on LED headlight setup and perhaps some jets for my mikuni 20mm VM round slide carburetor (bolt on) for my 1978 honda express noped model nc50. This is an amazing USA hand-made moped muffler that is excellently crafted. MLM honda muffler pipes are hand crafted with eighteen gauge steel metal and are welded using a TIG (tungsten inert gas). This honda moped muffler pipe is built to last with removable end-cap silencer and coated using a rugged 1,500 degree high temperature powder coat. The muffler exhaust flange is 1/4 in thickness and the rear muffler bracket is 3/16 in size with a 1 1/4 inch slot for mounting... no hassle here. Visit MLM muffler online. You can find the MLM honda express NC50 & NA50 people's sidebleed pipe on the www.treatland.tv website. Current the muffer retails for $190 so buy it now before the prices goes up... or they sell out!! !